Veterinary BP Monitors are rechargeable. Available in Vet25 and Vet30 models, Veterinary BP Monitors are designed for use in exam room and operating room. Featuring motion tolerant technology, units come with turn off alarms and audible indicators options. Providing exact readings on awake and sedated companion animals, products retain up to 960 data points. Using Bluetooth connectivity, monitor's data can be transferred to reporting PC application for printing reports. Blood pressure measurement expert SunTech Medical has expanded its line of veterinary devices with the new Vet25 and Vet30 vital signs monitors for companion animals. The new monitors expand on the features of the clinically validated Vet20. The veterinary monitors use motion tolerant technology and SunTech’s Advantage VET blood pressure, an animal-specific algorithm to provide accurate readings on both awake and sedated companion animals. To better manage nervous animals, the Vet25 and Vet30 feature extremely quiet operation, with the option to turn off alarms and audible indicators. 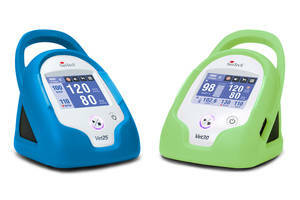 The Vet25 is designed for monitoring blood pressure in either the exam room or operating room. The Vet30 combines SunTech’s trusted blood pressure technology with oxygen saturation and temperature capabilities for monitoring before, during and after a procedure. Both monitors are equipped with the ability to program automatic readings at intervals during a monitoring period. The Vet25 and Vet30 are both portable and rechargeable. The monitors retain up to 960 data points, even when powered down. Using Bluetooth connectivity, data can be transferred to a reporting PC application for printing reports and creating PDF or CSV format data files. For more information, call SunTech Medical at 1.800.421.8626 or visit www.suntechmed.com/vetbp. SunTech Medical, a Halma company, has been the preeminent supplier of clinical-grade blood pressure monitoring products and technologies for 30 years. More than 75 companies trust SunTech Medical's OEM non-invasive blood pressure solutions for their patient monitoring needs. SunTech Medical produces the leading cardiac stress test blood pressure monitor and is the world's foremost manufacturer of ambulatory blood pressure monitoring products. SunTech Medical also offers solutions for in-office blood pressure monitoring for human and veterinary markets, as well as a complete line of blood pressure cuffs designed for general and specific applications.